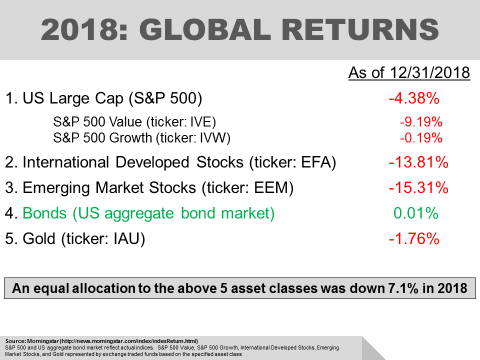 In 2018, most asset classes ended the year in negative territory. US bonds finished the year just barely in positive territory (+0.01%), while all others listed below were negative. 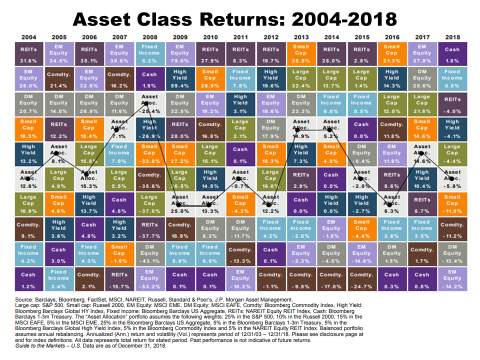 Based on the below chart, a diversified portfolio consisting of the included 5 asset classes, would have been down over 7% in 2018. Also, the chart below shows the return of volatility in stock markets in 2018. 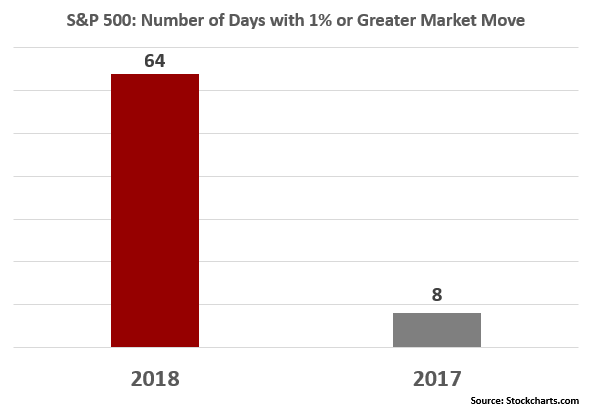 2017 was an abnormal market in terms of lack of volatility, with 8 instances of greater than 1% daily moves (up or down) in the S&P 500. In 2018, the number dramatically increased to 64 days. While the reasons can be different, the fact is uncertainties are commonplace in the stock markets. We will always have risk and be faced with unknowns that can swiftly change the course of the markets in the short term. This is not new. Because of this, timing the market is extraordinarily difficult and usually destroys value over time. Remember, diversification works over time, not all the time. 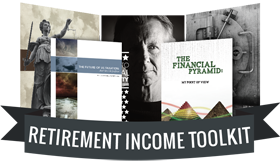 Being properly diversified means some assets will be outperforming your portfolio, while others will be underperforming. However, the chart below reflects that asset leaders and laggards vary significantly from year to year, and significantly shifting assets toward what worked in the past is generally a losing proposition.